Tile makes a lasting difference. We are full service tile installers in Calgary. New and reno kitchen, bathroom and flooring tiles installed with the professional workmanship and experience that you require. We are full service tile installers in Calgary. Kitchen, bathroom and flooring tiles installed with the efficient, professional workmanship that you require. Our aim is to be the most reliable service provider in our industry. That is why, after 10 years of service in the city of Calgary, and 14 years of experience in the industry, we continue to back up all of our work with a 2-year guarantee on labour and support all manufacturers' warranties on product. With Tile by Style, you can be confident that your project will be installed correctly and have the longevity you expect from tile. Please take a look at our photo galleries below that present a range of our tile installation work from new home construction and renovations in Calgary. (403) 478-1181. You can also send us an email: tilebystyle@gmail.com. If you`re thinking about renovating your kitchen or are interested in choosing the perfect tiles for your new home, give us a call. 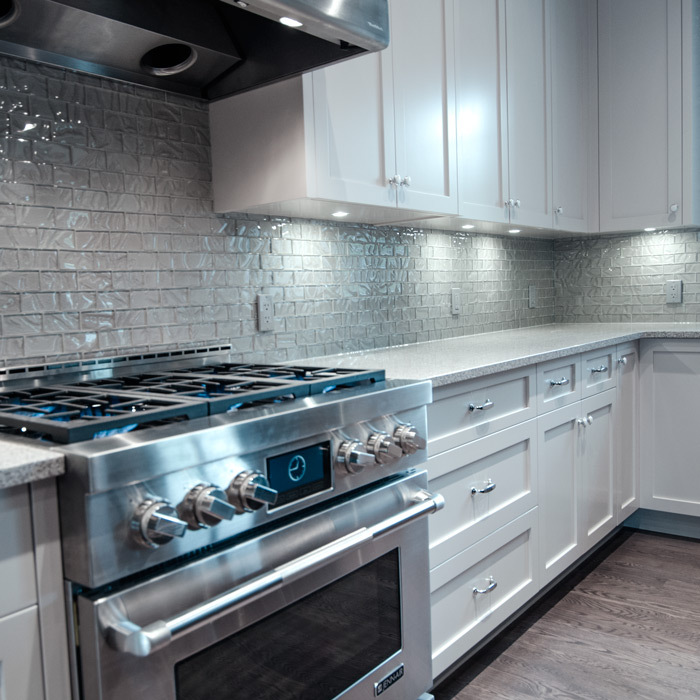 Our knowledge of glass, ceramic, and stone backsplash design can give you the luxury look you want. 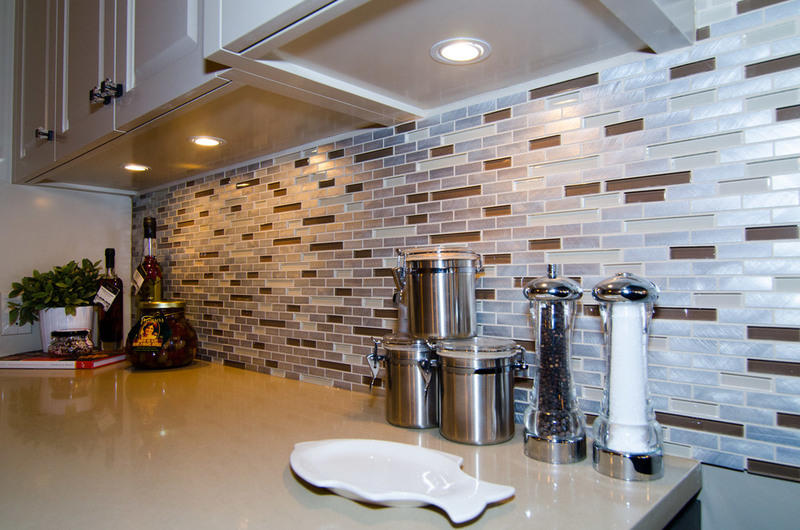 View some of our Kitchen Tile Projects. Tile by Style specializes in custom shower enclosures and tub surrounds. 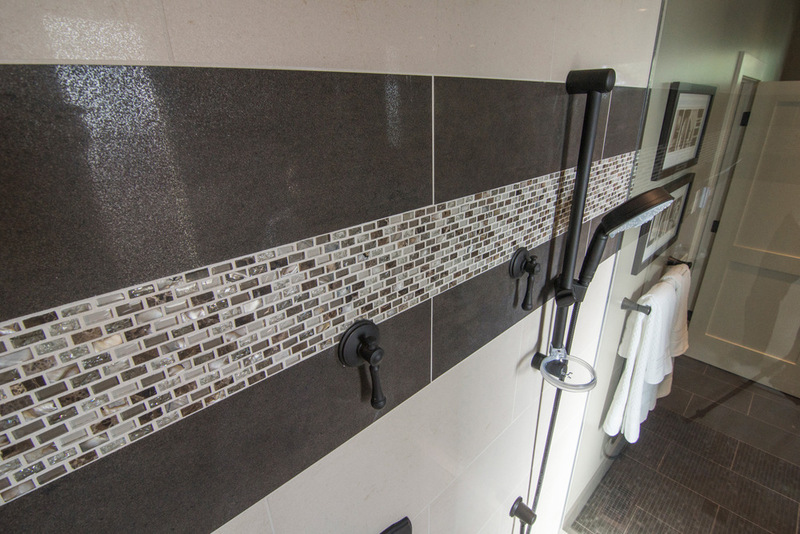 With our extensive experience crafting unique, hand-tiled showers we can create the at-home spa of your dreams. 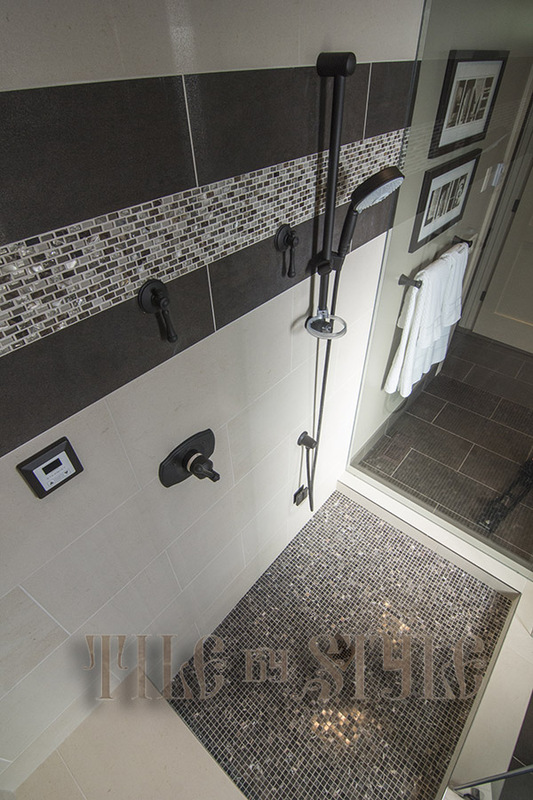 Click here to view a gallery of our residential bathroom installations and custom showers. We can turn your existing fireplace into a beautiful centerpiece for your living room or family room with a tile or stone finish that is clean and modern and fits with your style. 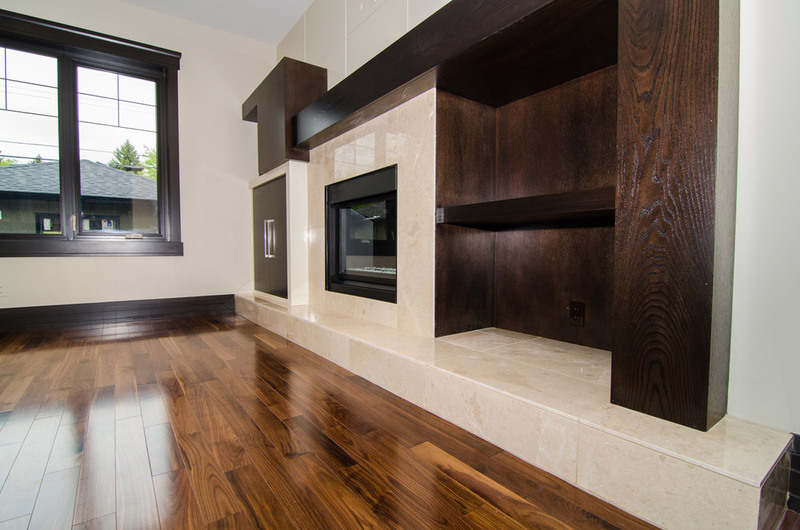 Gallery of residential stone and tile fireplace installations and renovations. 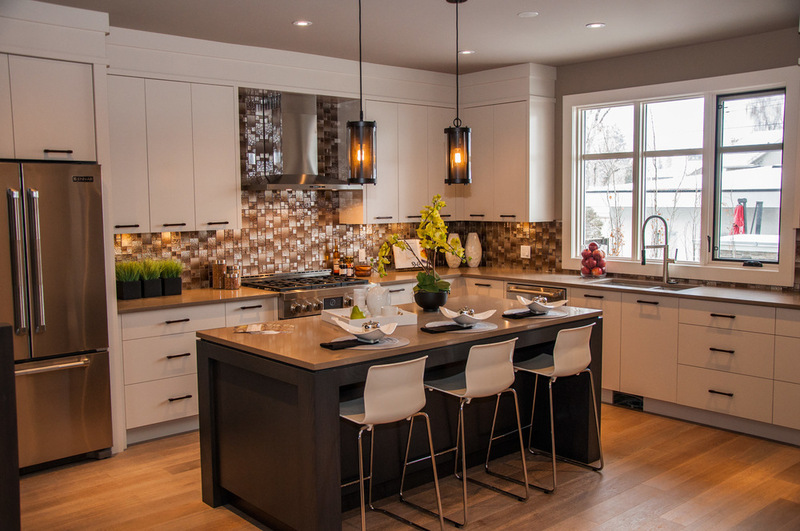 This new home by Le Chateau Custom Homes features minimalist stone tile features in the kitchen and master bathroom. 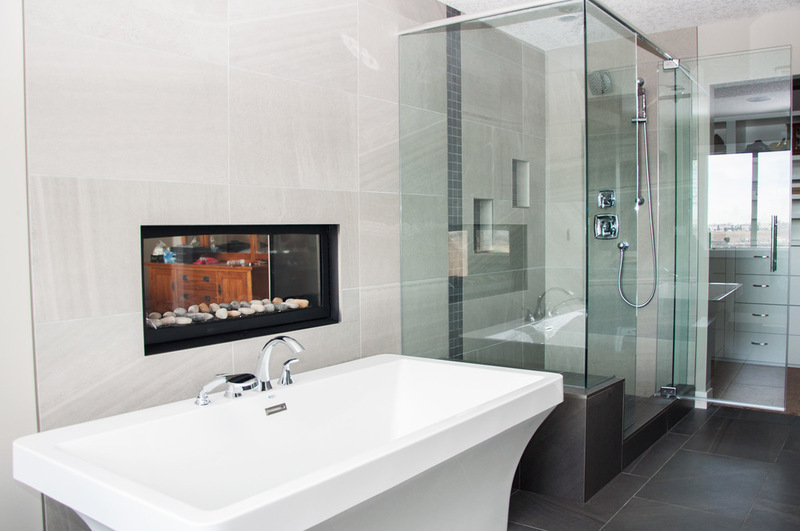 Fireplaces are framed by black glass tiles. Clean, light design details for this Calgary inner city custom home. 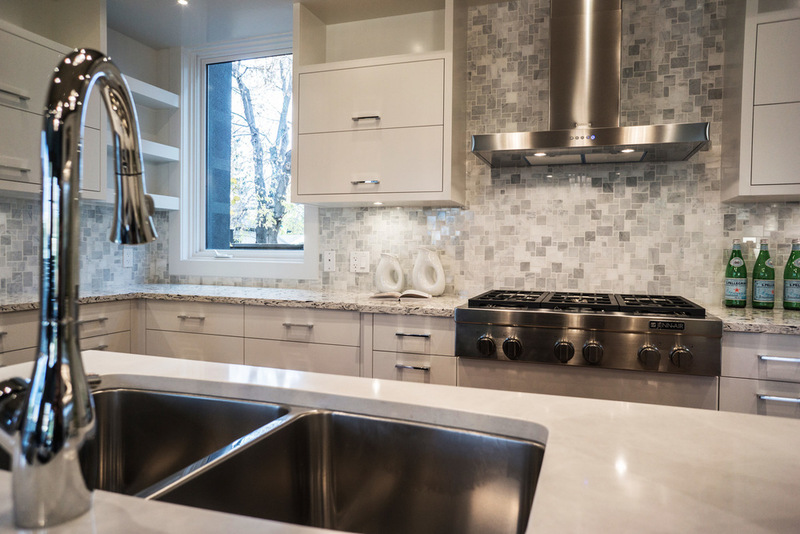 This custom residential project in Northwest Calgary features natural stone tile in the kitchen backsplash to accent the counter top. Marble tile in the bathroom floor and along the walls are complimented by a hand-tiled stone mosaic in the floor and ceiling of the shower enclosure. Fireplaces framed with black glass tiles create striking focal points for the living room and office. A blend of mosaic tile throughout the kitchen and mosaic tile accents in the custom shower along with a stone tile fireplace add a unique character to this custom home. This inner city Calgary home has a modern look. The steel fixtures and appliances in the kitchen are surrounded by a back splash of small stone tiles that blend to create a sharp background for the room. The master bedroom has a two-way fireplace framed by natural stone. In the bathroom, the stone tiles on the walls and floor are accented by bronze fixtures. 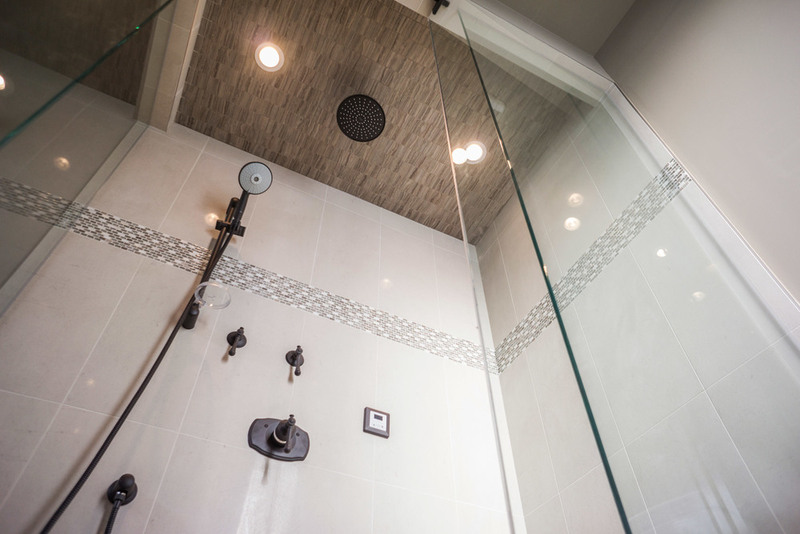 Mosaic tile accents line the wall of the custom shower enclosure and are mirrored in the tiled drain and ceiling of the shower.